HomeArchiveBlack Angels, White Devils: What’s the Media’s Agenda? Black Angels, White Devils: What’s the Media’s Agenda? • White man killed by cops: no coverage. • Black man killed by cops: 24-hour coverage. Over the past few weeks, Americans have been captivated with media coverage of the killing of an unarmed black teenager in Ferguson, Missouri, by a white police officer and the resulting riots. Few Americans are even aware that only two days after this shooting an unarmed young white man was shot by a black police officer in Salt Lake City, Utah, and his friends and family protested the killing without burning down the city. Why the double standard? When 20-year-old Dillon Taylor, a white male, was shot dead by a black police officer, President Barack Obama did not call in from Martha’s Vineyard to tell America how “heartbreaking” the shooting was and to offer his condolences to Taylor’s family as he did to the Brown family. He didn’t promise that Attorney General Eric Holder would be investigating the case as he did with Brown. Al Sharpton and Jesse Jackson didn’t show up in Salt Lake City, nor did the national media jump all over the story of a white youth shot by a “racist” black cop. A few dozen Salt Lake City residents peacefully protested carrying signs about “justice for Dillon,” but there was no rioting, no looting, no burning down of shops, as there was in Ferguson. One might think that the shooting of Brown was undeserved, whereas Taylor perhaps had it coming. Taylor was exiting a 7-Eleven with his brother and cousin when officers arrived in response to a report of a man with a gun in the area and thought Taylor fit the description. When the officers confronted the three youths and asked them to raise their hands, two of them complied but Taylor walked away, listening to music on headphones. That’s when police shot and killed Taylor. Taylor’s brother said Taylor was wearing headphones and didn’t immediately hear the officers, who were shouting conflicting commands for Taylor to both raise his hands and get down on the ground. Unlike Taylor, Brown had in fact just robbed the convenience store he came out of and even roughed up the clerk. After the robbery, he and his friend were walking in the middle of the street and refused the officer’s direction to move to the sidewalk. Brown did not simply walk away when the white officer asked him to raise his hands, as did Taylor. He rushed toward officer Wilson after having already punched him hard enough to break his eye socket and trying to take his pistol from him. Everything about the way the Brown case was presented to the public is identical to that of Trayvon Martin, including pictures of Brown as a much younger school boy. At the time of the shooting, Brown was 6’4” and weighed 292 pounds. Like Martin, there are recent pictures of Brown shown in gangster style photos, holding a .45 pistol and a wad of cash in his mouth while displaying gang member hand signs. There is a glaring double standard in America with a definite agenda to incite racial tensions. Black crime and violence against whites, now at epidemic levels, is consistently swept under the rug, while fictitious stories of white racism against blacks are invented and promoted by the media in order to further escalate black on white crime. Has the media shown the September 2 killings of five elderly whites in Kansas City, Mo. by a black man? Three were shot, and a couple in their 80s were beaten to death. How about the September 3 killing of a white police officer in Rochester, New York, by a black man? These stories, and many others involving black-on-white crime, get suppressed by the media, not to mention countless cases of mobs of blacks attacking whites and beating them. And then there is the “knockout game,” where blacks sucker-punch predominantly white strangers as hard as they can, sometimes killing them. 3 Comments on Black Angels, White Devils: What’s the Media’s Agenda? Read about a former Black racist cop, Jeff Foxx, of Columbus, Georgia. Jeffrey Foxx , a disgraced former Columbus, Ga. police corporal, and Michael Weaver, a Columbus-born, long-time white-rights activist. Foxx, who is black, resigned from the department in early May after a long litany of misconduct charges dating back to 2002. During this period, Foxx had been suspended from duty seven times for various misdeeds while a police officer. Foxx’s misdeeds while under the “color of law” first sparked the attention of the local media in March of 2007, when he was accused of targeting white motorists for traffic tickets. While patrolling the predominantly white area of University Avenue in north Columbus on March 7, Foxx was talking to a female friend on his cell phone. Unbeknownst to him, his conversation was being recorded by the recorder in his cruiser. The recorder recorded Foxx’s statements to his friend: “They make me work these white folk’s areas, somebody’s going to pay the price,” he said. He added: “I am hooking these white folks up with tickets.” Although Foxx violated several state and federal laws via his misconduct, he kept his job as an officer of the law. Had Foxx been a white officer, he would immediately have been fired for racial profiling, an egregious violation of state and federal law and the iron law of political correctness. But he was not. Instead, Foxx was “punished” with a one-day paid suspension and ordered to attend a few hours of sensitivity training by his superior officer, police Major Julius Graham, who is black. In Feb. 2009, Foxx was fired by Police Chief Ricky Boren for lying about an incident that occurred in the Muscogee County Jail, the details of which have never been disclosed. His dismissal was subsequently reversed by the department’s Personnel Review Board, and he was rehired. In early May of this year, Foxx accused Chief Boren of using the “N-Word” while conversing with three of his lieutenants in a bathroom on the fourth floor of the Public Safety Center, an allegation that Boren denied. In a May 14 interview conducted by the Columbus Ledger-Enquirer, Boren said that he has a private bathroom in his office, and never uses the public facilities. Mayor Theresa Tomlinson hired retired Georgia Bureau of Investigation (GBI) agent Michael Rundles to investigate the the alleged incident. Rundle’s investigation and subsequent 24-page report found no evidence of misconduct on the part of Boren. In a statement to the Ledger-Enquirer, Tomlinson told reporters: “There is no question in my mind that the chief ever made such a statement.” Foxx submitted to a polygraph test regarding his allegation, which he failed. No state or federal charges were filed against Foxx for his violations of the civil rights of the white citizens of Columbus under the color of law. He was allowed quietly to resign amid provable charges that would have landed a white police officer in federal prison for many years. The two-tiered, separate-and-unequal system of justice that prevails in Columbus, an erstwhile slave-owning town, treated white-rights activist Michael Weaver much differently. While sitting in his car after leaving a friend’s house, he was accosted by two black thugs wielding 40-ounce glass beer bottles, potentially deadly weapons. One thug converged on Weaver’s passenger side door, the other on the driver’s side. When the thug on the driver’s side sought to enter the car, Weaver sprayed him with non-lethal pepper spray. The thug turned his head, and the spray ran down the back of his neck. Weaver was arrested about an hour later by a black police officer and was charged with simple battery, a misdemeanor. The report filed by the officer indicated that the “victim” sustained no injuries and declined medical treatment. Both thugs were on felony probation at the time and were not legally allowed to consort with each other. Weaver attended State Court on three separate occasions to answer the misdemeanor charge, accompanied by this writer. His case was never called. Weaver and this writer didn’t know it at the time, but the die had already been cast, the fix was in. At the urging of a white female police detective who has hated Weaver for decades due to his politically incorrect activism, his misdemeanor case was referred to the district attorney’s office headed by D.A. Julia Fessenden Slater, the office that adjudicates felony cases. On the Tuesday morning of Aug. 23, 2011, Weaver was indicted by a Muscogee County Grand Jury on the charge of aggravated assault, a felony. Later that day, as Weaver and this writer passed by his house, Weaver’s car was pulled over by five county sheriffs department vehicles. The deputies rushed from their vehicles, guns drawn, and arrested Weaver. Weaver’s subsequent “trial” on Nov. 14 and 15 of 2011 was a hoax, a cruel joke, a Kangaroo Court travesty of justice, even for the dark, dirty, dangerous city of Columbus, Ga. In Georgia, an aggravated assault charge carries, upon conviction, a maximum sentence of 20 years in prison. Although Weaver’s use of pepper spray to repel two would-be carjackers does not normally justify a felony charge as written in Ga. Code 16-5-21, aggravated assault, Weaver’s public defender warned him that if he opted for a trial by jury, a jury that would be stacked, biased against him by the prosecutor, Asst. D.A. Michael Craig, he would likely be convicted and receive the maximum sentence, a verdict and sentence based not on the facts of the case but, rather, on his political ideology. Weaver, frightened and intimidated, opted to plead guilty to a crime he did not commit. Weaver’s “best interest” guilty plea brought him a sentence of 10 years, one to be served in prison, the remaining nine years on supervised probation with the stipulation that he be banished from the six-county Chattahoochee Judicial Circuit that includes Muscogee County, the county of his birth. The presiding judge, Superior Court Judge Bobby Peters, warned Weaver that if he were within these boundaries he would be arrested and serve the remaining sentence in state prison. Banishment is a punishment that harkens back to Medieval times, a punishment outlawed by the 1215 English Magna Carta. In all, Weaver served 20 months and four days in jail and in two Georgia prisons for the heinous crime of defending his property—and life—from two low-lifes who sought to take what was not theirs. Weaver was finally released from the gulag on April 24, four days after his 33rd birthday. He now resides in a county in northern Georgia, a county that, unlike his home county, is comprised mainly of his racial kinsmen. Since his release, Weaver has been updating the blog he started before his unjust incarceration, the White Information Network (WIN) at news4whites.blogspot.com. His efforts have borne succulent fruit, has grown into a Tree of Knowledge for people seeking truth and understanding. The story of his travails was featured in the July 1 edition (issue no. 26) of the American Free Press written by John Friend. The whereabouts and activities of the black racist rogue cop, Jeffrey Foxx, are at this time unknown. One hopes that he has not moved on to another police department where he can, under the auspices of the law, continue to use his tarnished badge to violate the rights of white citizens. This writer is immensely proud of his son, Michael David Weaver/Carothers. 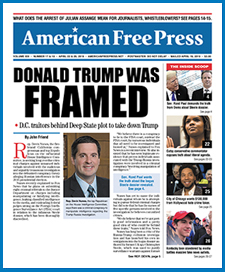 Support him by logging onto his blog at: News4whites.blogspot.com and by subscribing to America’s most informative weekly newspaper, American Free Press. Apparently Amerika reaps the poisonous demon fruits of ‘white guilt,’ a clever $trategem seeded by racist/bigoted politi-call-lie correckt-a** leftists and employed for manipulating the masses by enabling blacks to avoid accountability for their individual and collective misbehavior. Divide and conquer, the opposite of Dr. Martin Luther King Jr. Thanks to AFP for shining the light on black on white crime. White people will continue to be victims of these horrendous crimes until there’s a rise in awareness that these things do indeed happen. Only when you know there’s a threat can you protect yourself. They want us weak and vulnerable so we can be victimized. No more! Share this article with your friends and family, it might save their life.